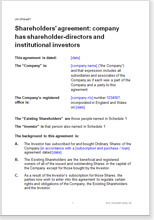 This shareholder agreement has been drawn to include the provisions that a large professional or institutional investor such as a business angel, venture capital or private equity investor would require to protect their investment. It also considers the provisions of minority shareholders, who by virtue of the circumstances are likely to be the founders and friends and family of the founders. Note: It is important that the constitution of the company is in terms which permit and support this agreement.